LBD & ONESIES - A Lifestyle Blog: Romwe Dresses Giveaway! The giveaway will run from August 17 to August 31. Prizes will be shipped directly to the winners by Romwe.com. I would like to have the "Black Kitty" Dress. I would love love to win Riveted Shoulder Pink Dress.. Its beautiful and pretty perfect for any occasion.. The dress is very beautiful! Thanks for the giveaway! Great giveaway! I would so love to win this dress http://www.romwe.com/golden-metal-and-tassels-embellished-black-dress-p-67433.html? My favourite is the Black Kitty Dress. Thanks Mish for the invitation! Hi, I'd like to win this please. 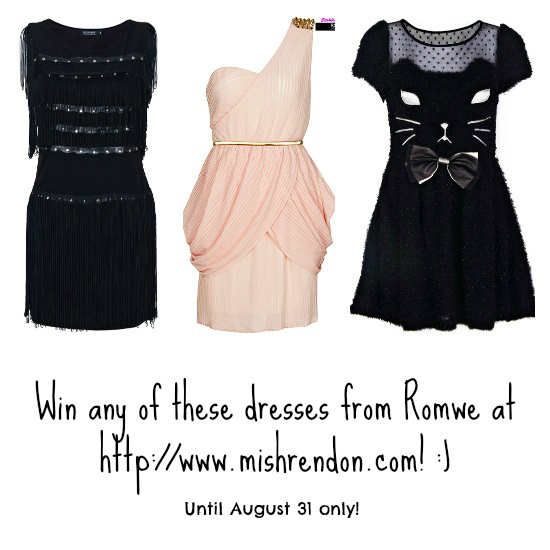 I would love to win "Black Kitty" Dress!